The quilts I make are not traditional “quilted” quilts. I like to refer to them as quankets (pronounced ‘kwang-kits’). Quilted quilts are when the patch-worked top is then “quilted” onto a backing piece of fabric, with a layer of batting in between. This is typically done using a long arm sewing machine (which I don’t have) or by hand (which I don’t have the patience for). I love the aspects of piecing, and backing my quilts with blankets allows me to focus on piecing, while not stressing (or spending a lot of money) towards having them professionally long arm quilted. It has never been my intention for my quilts to be works of art: they’re pretty, and that works for me. I find that by not undertaking each quilt with the notion that it has to be a work of art, it liberates me to explore new ideas, and experiment with colors, patterns, and textures – I LOVE textures. In Maypole, the white fabric is a polyester that I inherited from Granny: no doubt, fabric she had intended for a pant suit – Granny loved her polyester pant suits! It has a fabulous line and texture detail. I have had this fabric on my shelf for years, shying away from it for a quilt project since it is polyester. But, it is super soft, and after experimenting with wool in my Virgie’s Wagga quilt, I figured that I should give the polyester a try. I follow several blogs, and many bloggers lament the market for quilts, and how overseas mass production has made selling homemade quilts more difficult. 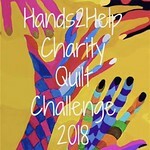 I am fortunate that I have the time, resources, and ability to make and donate quilts. I only hope that more quilters out there, that are ‘stuck’ in the place of not knowing if they should quilt for profit, artistry, or charity, choose the later 🙂 Don’t let unused quilts lie in your studios, hang on walls, unused, perhaps in the hopes that they will some day be a work of art. Just donate them – the act of letting go is so fulfilling! This was donated to the County of Ventura, Children & Family Services, for a foster child in June 2016.